Minford’s Livi Shonkwiler scored a team-high 12 points in Saturday’s 51-44 loss to Washington. Minford’s Hannah Tolle shoots during the first half of Saturday’s 51-44 non-league loss to Washington. 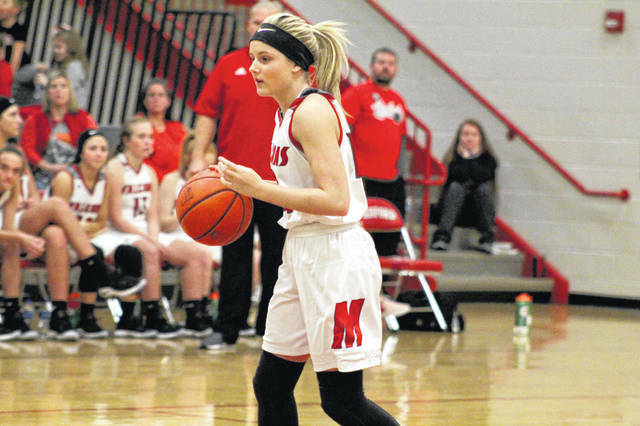 MINFORD — For the third time in the last two weeks, Minford’s girls found themselves staring at the wrong side of the scoreboard. But for the third time in the last two weeks, the Falcons got exponentially better while learning valuable lessons about their locker room. After a 54-45 loss to Miami Trace on Jan. 14 and a 46-44 loss at Oak Hill three days later, Minford fell to Washington Court House Saturday evening by a 51-44 final. Namely Livi Shonkwiler, Caitlyn Puckett and Hannah Tolle. While Minford’s leading scorer Ashley Blankenship sparred with Washington’s Hannah Haithcock all night long — being held to just five points — her teammates had her back. Shonkwiler led the team with 12 points, Puckett added 11 and Tolle had 10 while knocking down two crucial 3-point field goals to keep the Falcons (13-5) within reach of the lead. Shonkwiler was a sparkplug. The sophomore, who doesn’t play like a sophomore, clogged passing lanes, forced turnovers, turned defense into offense and knocked down the shots she needed to knock down. Just another night at the office. The first quarter saw four lead changes as both teams traded punches. Haithcock gave the Blue Lions the first lead of the evening, scoring with 7:02 left in the first quarter before Tolle gave Minford its first lead at the 4:23 mark, 6-4. Puckett put the Falcons on top 10-7 with 1:14 to go but Washington ended the sequence on a 4-0 burst, taking an 11-10 lead into the second. The Blue Lions then used a mix of Haithcock and a sharpshooting Shawna Conger in the second to create separation. Conger hit a 3 to make it 14-10 and close out a 7-0 run before the duo hit back-to-back baskets with less than two minutes to go, extending the edge to 23-16. By halftime, Washington owned a 25-16 advantage after winning the second quarter, 14-6. That eight-minute period was ultimately the Falcons’ downfall. Minford held serve in the third, cutting the lead to seven at 37-30 heading into the final quarter. The Falcons managed to cut the lead to three points multiple times in the fourth, including the 5:44, 4:19 and 1:59 marks, but never could get over the hump. Haithcock led the Blue Lions (14-5), posting a double-double with 24 points and 12 rebounds. Conger followed with 12 points while Bre Taylor added nine. Rayana Burns also pitched in, tallying four points, five rebounds and six assists in the victory. 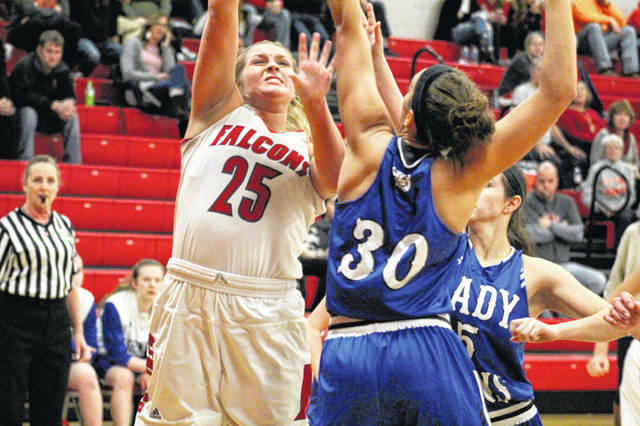 Minford was led by Shonkwiler’s 12 points while Puckett added seven rebounds to her 11. Tolle ended the night with 10 points and three assists, Maddie Slusher had six points, and Blankenship finished with five points and seven boards. Minford will be back in action Thursday evening, traveling to Waverly in Southern Ohio Conference play. The Falcons won the first matchup between the two by a 53-36 final. Washington: 19-46 FG, 9-10 FT, 4-10 3pt. (Conger 4), 26 rebounds (Haithcock 12), 20 turnovers, 8 assists (Burns 6). Scoring: Haithcock 24, Conger 14, Taylor 9, Burns 4. Minford: 19-49 FG, 4-7 FT, 2-15 3pt. (Tolle 2), 22 rebounds (Blankenship 7, Puckett 7), 18 turnovers, 9 assists (Shonkwiler 3, Tolle 3). Scoring: Shonkwiler 12, Puckett 11, Tolle 10, Slusher 6, Blankenship 5.